Bollywood films over the past 2-3 years has been making a concentrated effort towards doing films on real-life events. Now, Ajay Devgn is all set to share the screen space with Parineeti Chopra again in Abhishek Dudhaiya’s ‘Bhuj: The Pride of India’. The ‘Singham’ actor will play squadron Leader Vijay Karnik. Parineeti Chopra took to her twitter account and shared the news. The project will also feature Sonakshi Sinha, Rana Daggubatti, Sanjay Dutt and Ammy Virk. This feature film will revolve around squadron Leader Vijay Karnik who was the in charge of Bhuj airport in Gujarat during the Indo-Pak war of 1971. Parineeti Chopra will portray the character of ‘femme fatale’ Heena Rehman. 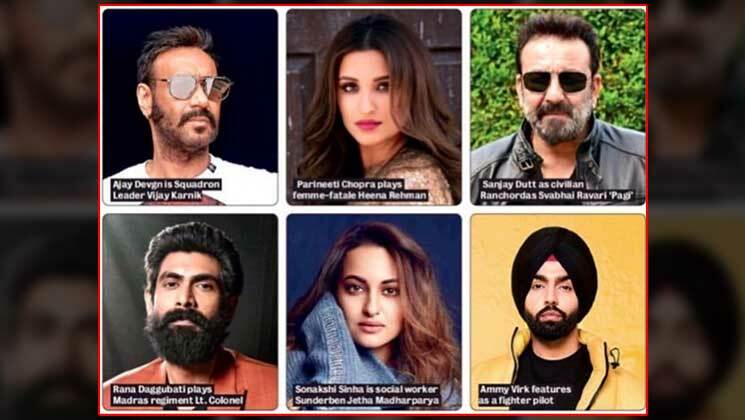 Sonakshi plays social worker Sunderben Jetha Madharparya, Sanjay Dutt plays civilian Ranchordas Svabhai Ravari, Rana plays a lieutenant colonel from the Madras regiment and Ammy plays a fighter pilot. Bollywood is certainly caught in patriotic fervour and this super-six squad of ‘Bhuj: The Pride of India’ hopefully can do the justice to the film. Ajay Devgn recently gave a huge blockbuster in ‘Total Dhamaal’ and is known for versatility and bringing uniqueness to his roles.